Interactive map of 9 Asian biomes. Geography learning game. 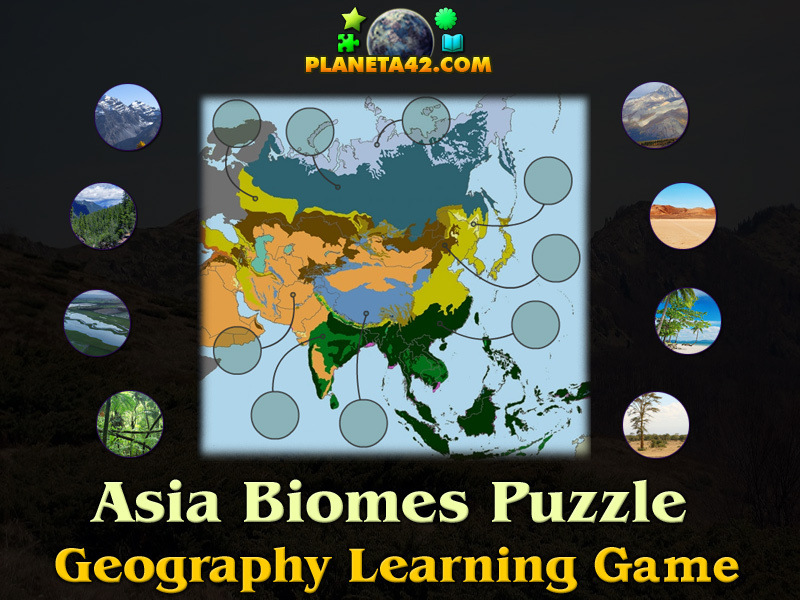 "Asia Biomes Puzzle" is a free online knowledge level game to find the correct biome of Asia environment map. 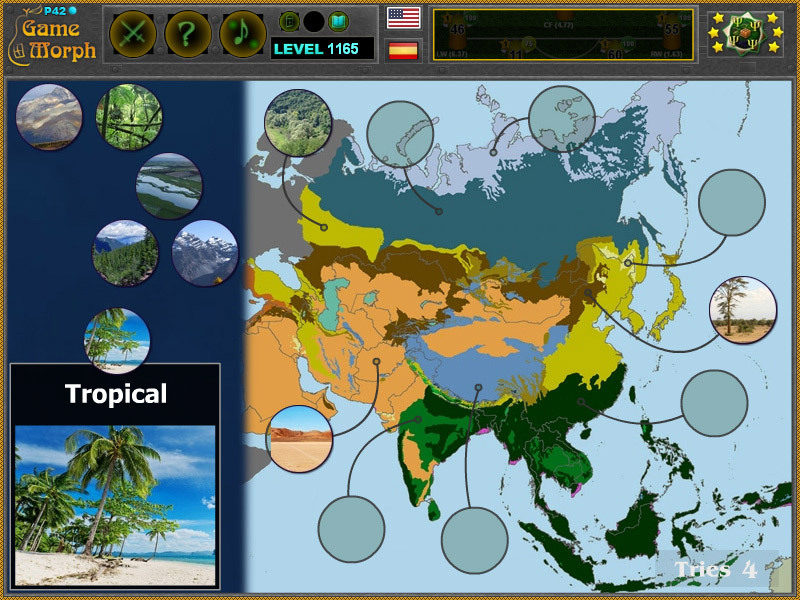 Fun educational geography game to exercise or study the habitats and terrestrial vegetation of Asia, suitable for online lessons and interactive classes. Minute to win it game. Bimes game. How to play Asia Biomes Puzzle. There are 9 movable pieces of Asia biomes situated on the left side of the screen. Drag and drop them on the correct slot of asia terrestrial map to the right of the screen. The information window shows a beautiful landscape of the biomes. Know 3 biomes of Asia and get +1 Knowledge Level. Asia has extremely diverse climates and geographic features. Climates range from arctic and subarctic in Siberia to tropical in southern India and Southeast Asia. It is moist across southeast sections, and dry across much of the interior. Some of the largest daily temperature ranges on Earth occur in western sections of Asia. The monsoon circulation dominates across southern and eastern sections, due to the presence of the Himalayas forcing the formation of a thermal low which draws in moisture during the summer. Southwestern sections of the continent are hot. Siberia is one of the coldest places in the Northern Hemisphere, and can act as a source of arctic air masses for North America. What environment zones do Asia have? How many biomes are there in Asia? What is the abundance of deserts in Asia? Where do pine trees grows in Asia? What are the biomes of Asia? What habitats do Asia have? Labels: Biome Games , Interactive Maps , Puzzles , Geography Games , Education Games , Asia Games , Free Online Games.